Should this book be science fiction, I might soon become a celebrated and popular writer. Even critics would praise my soaring fantasy! The trouble is that this is reality. 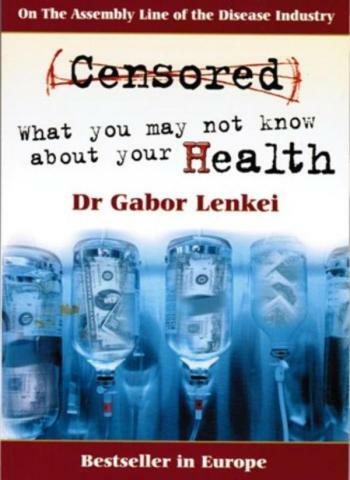 Dr. Gbor Lenkei The book has answers to questions that a doctor has asked himself to understand why medicine failed to heal. Censorship means: thought police. It means other people deciding, dictating what we can know and what we should never learn. Is health really censored? Are vital scientific discoveries really kept secret? Why do we live half as long as we possibly could? Why do only traditional people live to be a hundred? Who shapes our ideas on health? Why were the most important scientific discoveries abouth health suppressed, and by whom? How can you make a fortune on children, using an invented illness? What are the most important causes of obesity? Who concealed the cure for cancer? Do you know how easy it is to remain in a good health? Do some people really want us not to be fully healthy? Are we led by the nose?